These breathtaking pictures appear to show a little girl seconds away from becoming a hungry tiger’s lunch. Little Avery Thompson seems oblivious to the 370lb Royal White Bengal Tiger as he stretches out a massive paw in an attempt to touch her. 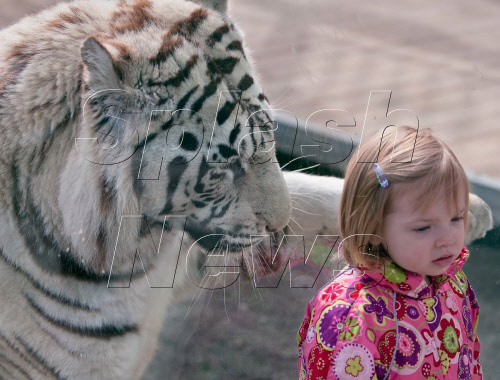 But, despite appearances, the toddler is perfectly safe – she and Almos the tiger are separated by a thick pane of glass. Keen amateur wildlife photographer Dyrk Daniels was photographing the Bengal Tigers. Little Avery had her back to the glass at first when Almos approached her, so she had no idea the tiger was that close.